A favorite restaurant of Ian Fleming while in London was Scott’s. During Fleming’s time it was located at 18-20 Coventry Street in Piccadilly Circus in Westminster. 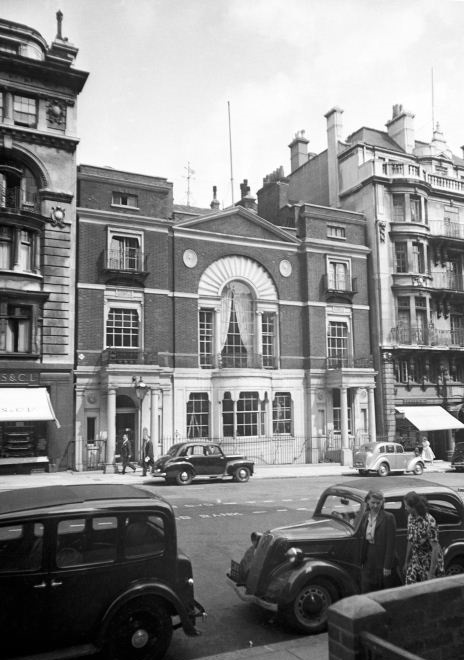 Four years after Fleming’s death, the restaurant moved to its current location on Mount Street in Mayfair. Fleming went to Scott’s for lunch for many years, including during WWII when he was working for Naval Intelligence. It was the site of one of his more humorous plots. Fleming took captured German U-boat officers to Scott’s to try and get them drunk so that they would perhaps spill some intelligence. The waiter heard the group talking in fluent German and telephoned Scotland Yard. The incident caused much amusement among the British Intelligence community. Fleming’s boss, Admiral Godfrey however, was not among those amused. When Fleming began writing the James Bond stories, he made several references to Scott’s, putting his character in the very same table which Fleming preferred himself. Bond sat at his favourite restaurant table in London, the right-hand corner table for two on the first floor, and watched the people and traffic in Piccadilly and down the Haymarket. 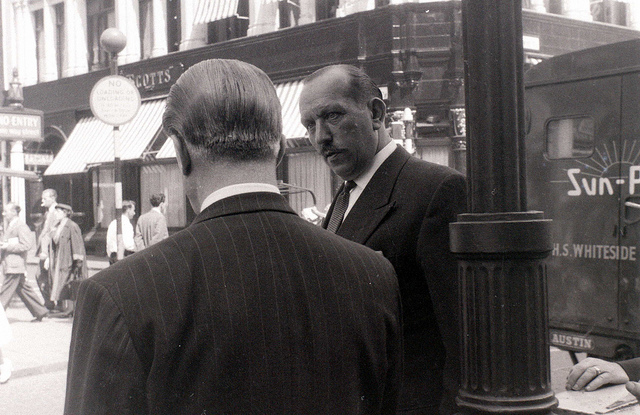 In this 1957 photo, Scotts can be seen in the background. When James Bond first arrives in Tokyo in You Only Live Twice, he meets up with Dikko Henderson. The crowd parted unresentfully to let the giant through, and Bond followed in his wake to a smart Toyopet saloon waiting in a no-parking area. The chauffeur got out and bowed. Henderson fired a torrent of instructions at him in fluent Japanese and followed Bond into the back seat, settling himself with a grunt. The Okura in Tokyo opened in 1962, making it indeed one of the newer hotels at the time of Bond’s visit. The main lobby of the hotel is largely unchanged from the day that it opened. Bond and Dikko pass a few hours doing some “serious drinking in the Bamboo Bar of the Okura.” While there is no Bamboo Bar, Bamboo is prominent throughout the facility. It looks like the Highlander Bar would be a good fit for Bond and Dikko. Sadly, the original building of the hotel is scheduled to be torn down in September, 2015. There is an online petition against the demolition. A large chunk of the early portion of Moonraker is set at the fictional gentleman’s club of Blades. The exact date of the foundation of Blades in uncertain. The second half of the eighteenth century saw the opening of many coffee houses and gaming rooms, and premises and proprietors shifted often with changing fashions and fortunes. 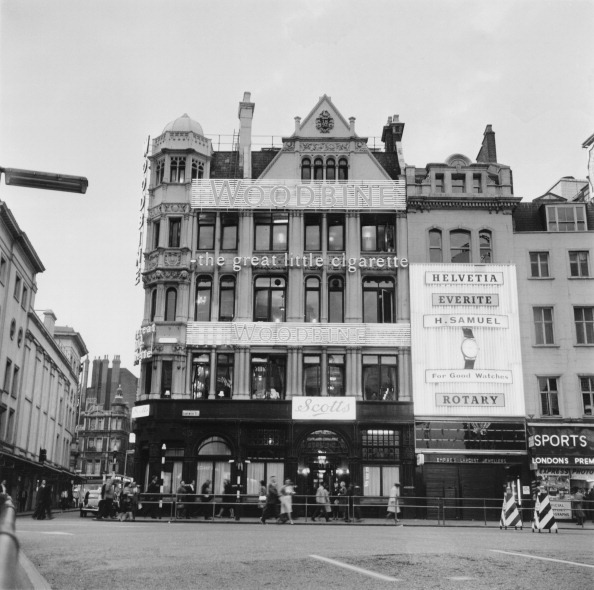 White’s was founded in 1755, Almack’s in 1764, and Brooks’s in 1774, and it was in that year that the Scavoir Vivre, which was to be the cradle of Blades, opened its doors on to Park Street, a quiet backwater off St James’s. The Scavoir Vivre was too exclusive to live and it blackballed itself to death within a year. Then, in 1776, Horace Walpole wrote: ‘A new club is opened off St James’s Street that piques itself in surpassing all its predecessors’ and in 1778 ‘Blades’ first occurs in a letter from Gibbon, the historian, who coupled it with the name of its founder, a German called Longchamp at that time conducting the Jockey Club at Newmarket. Doing a search for Scavoir Vivre brings up a book called Sporting Anecdotes, Original and Selected from 1822. It mentions a club by that name, and that The leading plan of the Scavoir Vivre was intended to patronize men of genius and talents; whereas soon became notorious as an institution tolerating every species of licentiousness and debachery. 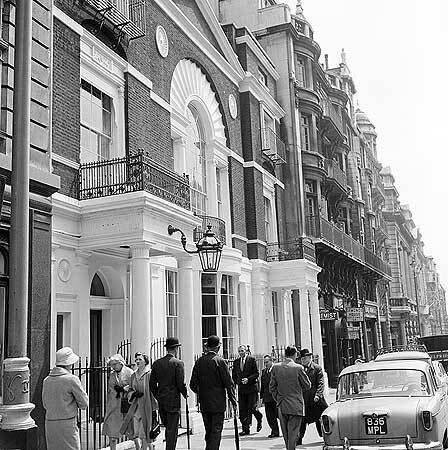 The address Fleming cites on Park street “a quiet backwater off St. James’s” is actually the location of Pratt’s club. It is said that Fleming actually based quite a bit of Blades on the real club of Boodle’s, which is on St James’s Street, and which resides in the place of the “Savoir Vivre” club (note the slight difference) which folded in 1782. He gives a further description of Blades as James Bond enters the club to have his dinner with M.
The Adam frontage of Blades, recessed a yard or so back from its neighbours, was elegant in the soft dusk. The dark red curtains had been drawn across the ground floor bow-windows on either side of the entrance and a uniformed servant showed for a moment as he drew them across the three windows of the floor above. In the centre of the three, Bond could see the’ heads and shoulders of two men bent over a game, probably backgammon he thought, and he caught a glimpse of the spangled fire of one of the three great chandeliers that illuminate the famous gambling room. Boodle’s certainly fits many of the items mentioned here, the Adam frontage, and notably, the fact that it is recessed a yard or so back from the buildings on either side of it. The bow windows on the bottom floor, and the three windows in the center of the floor above. Boodle’s Club, St James Street. The amenities and food and drink at Blades are second to none, and also described in rich detail, including the meal that Bond and M enjoyed together, as well as the club policies, even paintings on the walls. Interestingly, Fleming refers to Boodle’s in Moonraker, towards the end of the novel, when Bond is tailing Sir Hugo Drax, the latter is lunching at Blades, while Bond sits in his car in the row of taxis outside of Boodle’s. Both Blades and Boodle’s are also mentioned in You Only Live Twice. M was having dinner with Sir James Malony, to talk about Bond. It is August 31st. On the next day, 1 September, those members who were still unfashionably in London would have to pig it for a month at Whites or Boodle’s. Whites they considered noisy and’smart’, Boodle’s too full of superannuated country squires who would be talking of nothing but the opening of the partridge season. For Blades, it was one month in the wilderness. But there it was. The staff, one supposed, had to have their holiday. More important, there was some painting to be done and there was dry-rot in the roof. Fleming displays a bit of sardonic humor here. I’m sure we pity the poor souls who will have to “pig it” for a month at Whites or Boodle’s – two of the most famous and luxurious clubs in the world. This beverage of fermented rice (closer to beer than a rice wine) is a Japanese staple, and James Bond’s drink of choice during You Only Live Twice. In fact, other than “a pint of Jack Daniels” he consumes at the Miyako, it appears to be the only alcoholic drink Bond drinks in the book. In the first chapter of the novel has already consumed “five flasks” of Sake, the effect of which he compares to one double Martini. He says he’ll need another double Martini before the night is out. Bond goes past the eighth flask of sake while out with Dikko Henderson. 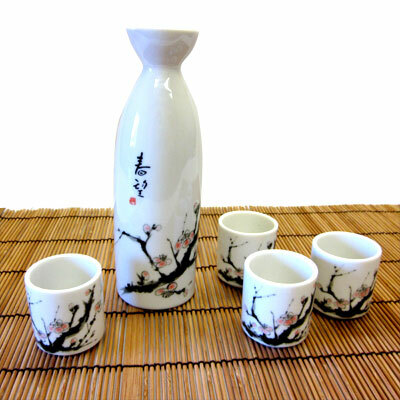 Before heading to the castle of Dr Shatterhand, during his “last supper,” Bond orders five flasks of sake to eat with his Fugo – Japanese blowfish.